Top Govt Jobs Of This Week. Dear visitors, Today we will give you information about top govt jobs in this week of 11 December 2016. Govt jobs are much needed job for job seekers in Bangladesh. 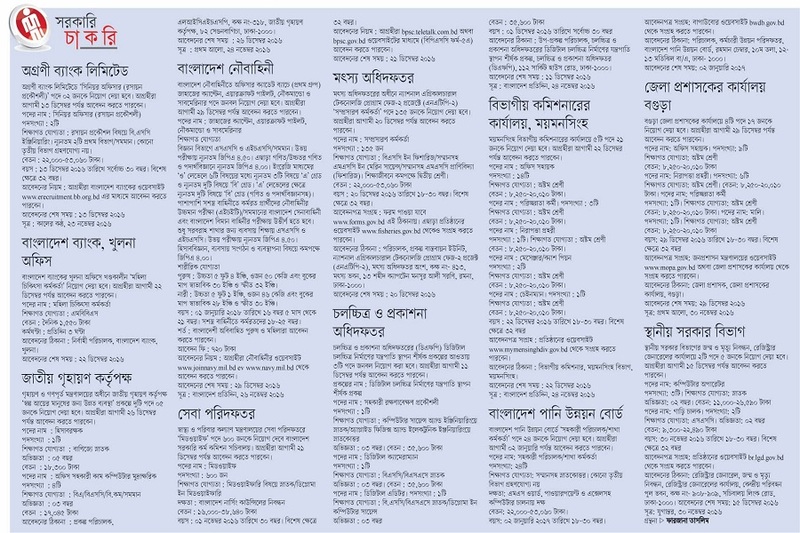 Every week there are many govt job circular published in Bangladesh. So, we tried to collect best govt jobs of the week for you so that you can find and read details of every job circular. We will give information from trusted Bangladeshi Newspapers Like Prothom-alo and jugantor.com. So, let’s take a look to Top Govt Jobs Of This Week. In this week Top govt jobs included Agrani Bank limited senior officer job circular 2016, Bangladesh Bank Limited Job at khulna Branch, Bangladesh Navy job circular, Sheba ministry job, Bangladesh Water Development Board Job circular 2016, Department of local govt job circular etc. I’m a graduate major from finance.. I want to do a job.. if u have any recruitment then please inform me..